Israeli soldiers abducted, on Thursday at dawn, a young Palestinian woman, and two men, during military invasions into homes, in different parts of the southern West Bank district of Hebron. 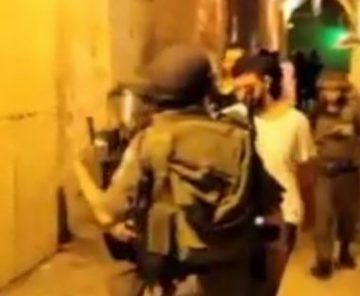 The Hebron office of the Palestinian Prisoners Society (PPS) said several military vehicles invaded Bani Neim town, east of Hebron, searched many homes and abducted a young college student, identified as Alaa’ Hesamuddin al-Hjouj, 26. The soldiers also invaded Yatta and Deir Samet towns, south and west of Hebron, searched many homes causing excessive damage, and kidnapped two young men. The PPS said the abducted Palestinians have been identified as Hatem Mohammad Abu Fannar, and Ahmad Khader al-Hroub.